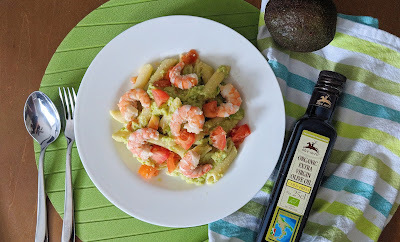 How to cook delicious Avocado Prawns Pasta with fresh tomatoes? *Scroll for the Printable Recipe Card if you want to skip the tips. Recently, I am very into Avocado because I chanced upon some articles on its amazing health benefits. It is rich in vitamins, protects the heart, reduces blood pressure and inflammation. I tried to make an avocado spread with olive oil and tomato juice - amazingly delicious. Then, I was curious. What else can I cook with avocado? Pasta! It turns out that Avocado Pasta, though not common in restaurants, is very common among online recipes. I invented my own according to my taste buds and it was delicious. I always use olive oil meant for everyday cooking such as this. For olive oil meant to be drizzled directly onto pastas or salads, I always go for a good quality one such as the Organic Extra Virgin Olive Oil from Italy. It is sold at NTUC Finest. I always soak my deshelled prawns in salted water for 30 min to enhance the freshness. The flesh also tastes firmer. By the way, do you know how to choose avocados? I did not and ended up with rotten ones as I thought that I should go for the soft ones. For my second batch, I chose dark and hard ones. Perfect! It is important to include fresh tomatoes chunks into an avocado pasta to balance the dish by providing that slight sourish kick, cutting through the creamy sauce. 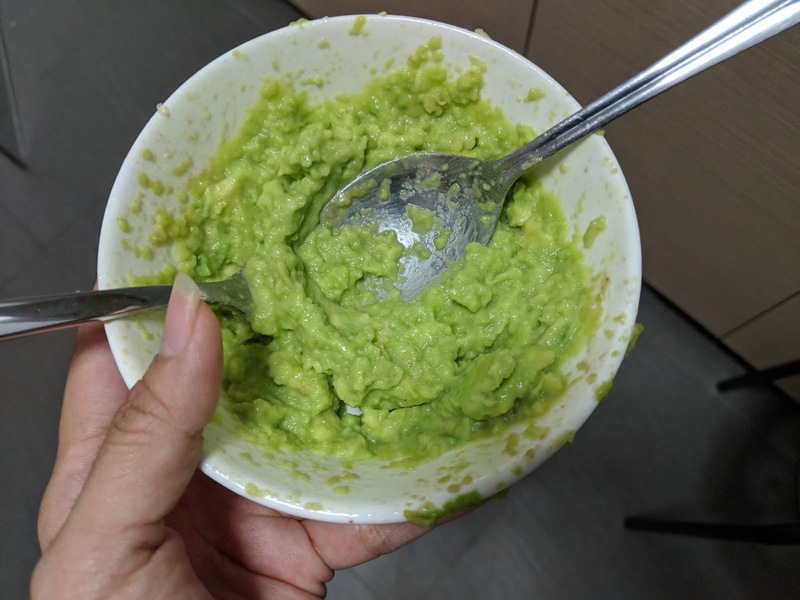 I mashed the avocado with a metal fork and spoon because I prefer such texture as compared to a blended one. 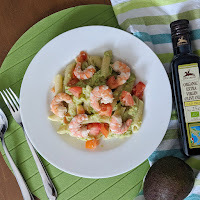 I love my Avocado Prawns Pasta with Tomatoes and I hope you will enjoy it too! Feel free to share my post with your fellow friends who love to cook wholesome food. Printable Recipe Card for your collection. Cut avocado into half with a knife and scoop the flesh into a bowl. Add 1 to 2 tablespoons of Extra Virgin Olive Oil and 2 tablespoons of milk into the bowl. Mash the avocado flesh using a metal fork and spoon until the texture turns creamy. Add salt to taste. You need 2 teaspoons of salt to balance the taste. Place the mixture into the refrigerator. Boil the penne until it is cooked al dente. Add salt to the boiling water. It takes about 20 minutes. Keep checking to prevent overcooking. Drain the penne of water and set them aside. Put some cooking oil on a frying pan and heat it up on medium heat. Place 2 teaspoons of chopped garlic on the pan and fry them until you smell an aroma. Add the prawns and fry them for approximately 1 minute on each side (for small prawns). Remove the prawns from the pan and set them aside. Pour the avocado mixture onto the same frying pan. Add 100 ml of fresh milk. Heat up the avocado sauce until it becomes smooth and creamy. Mix the avocado sauce with the penne. Serve the pasta on a plate. Place chopped tomatoes and prawns on the pasta. Drizzle extra virgin olive oil onto the pasta.